Gather family and friends and spend the weekend slurping on the country’s best and freshest oysters. And best of all, you won’t have to bust your budget as these tasty little guys will be available at great prices. Talk about a steal! But if these slimy creatures are not your cup of tea, then don’t fret as there’ll be plenty of other culinary deliciousness available at the festival. With over 50 food stalls and 40 wine estates present, you can tuck into a variety of mouthwatering options including braaiied prawns, gourmet goodies, international wines and so much more. This is definitely an event that will delight all your senses. Pop in at their Wine Theatre and learn from the experts, and savour their food delights created by their team of chefs. Kick-back and enjoy a sunny winter, highveld afternoon while sipping wine, tasting cheeses and experiencing the delights of an unforgettable gastronomic adventure. The Stables Village Market, 212 3rd Road, Chartwell, Johannesburg. This is one of those anticipated events in Joburg. It is an exhibit of books by a group of publishers and book dealers for promoting sales and stimulating interest. The Jozi book fair will include book launches, seminars, round tables, exhibitions, book sales, theatre, and jazz. There are also many more fun and interesting activities visitors can engage in. You definitely have no excuse not to attend. The festival provides a platform for readers, writers, artists, pupils, children, adults and the public. See you there! Thursday, 30 August 2018 to Sunday, 02 September 2018. Mary Fitzgerald Square, 120 Lilian Ngoyi Street, Newtown, Johannesburg. Kids and adults of all ages are invited to spend at least 30 to 45 minutes to try a variety of ice creams, sorbets and puddings. Entry fees are donated to the Magaliesburg Child Welfare Organisation. The factory is open and the credit card machine is available. The annual Rand Airshow returns for another day of tricks, stunts and demonstrations. Featuring old warbirds, helicopters, military displays, aerobatics, and more. Guests are advised to keep the rules and regulations in mind when attending the show. The Women’s Health Fit Night Workout Party is returning to Jozi for a winter warmer sweat session. Expect six super-cool workouts pitched at all levels of fitness. Your ticket gets you entry into the event and an amazing goodie bag – including a limited-edition Women’s Health Fit Night workout vest, the latest issue of Women’s Health, an adidas yoga mat, Shield deodorant and more awesome surprises from our sponsors. Stay hydrated with Powerade, plus, stand the chance to win incredible prizes on the night. Saturday, 18 August 2018 at 16:00 – 20:00. Montecasino, Montecasino Boulevard, Fourways, Johannesburg. Tickets are R360 – R399 per person, get yours online here! Wine Menu is honouring Women winemakers, brewers and distillers during the month of August. Guests are treated to a selection of wines, beers and gins with a variety of food available, as well as ample entertainment for the younger children. Guests are allowed to bring blankets. The holiday commemorates the national march of women on this day in 1956 to petition against legislation that required African persons to carry the pass Information. Over 20 000 women of all races and ages from every corner of South Africa marched together towards the Union Buildings in Pretoria in a national march petitioned against pass laws. “pass laws” legislation required African persons to carry a document on them to ‘prove’ that they were allowed to enter a ‘white area’ during the Apartheid regime. Organised by the Federation of South African Women, the March was led by four brave women; Helen Joseph, Rahima Moosa, Sophie Williams and Lilian Ngoyi. The leaders delivered petitions to Prime Minister JG Strijdom’s office within the Union Buildings in Pretoria. 100% Design South Africa, which runs alongside Decorex Joburg, offers a curated mix of products. These products include features from leading designers and brands catering to the residential, hospitality and commercial interior decor and design industries. Art. Art. Art. All weekend. Come and join us for a day of art and atmosphere and meet the artists…bring your kids, bring your friends...see you there! Oils, watercolours, mixed media, sculptures, photography, traditional, contemporary, wildlife, landscapes, still lives and more. Come along to the Wizards Vintage open day. Fourway's Farmers Market presents their Winter Country Music Festival with seven of the country's top Americana bands. Featuring Azurdee, Blue River Band, Vanessa Palm, Jon Delinger, Michael Naranjo, Gareth James and Shaun Miller as the live entertainment for the day. Their will be burgers, Steaks, gourmet milkshakes, craft beer, gin and more available at the various food and drink stalls for the whole family. Kids under 16 and folk over 65 enter free. The Durban July Handicap is a South African Thoroughbred horse race held annually on the first Saturday of July since 1897 at Greyville Racecourse in Durban, KwaZulu-Natal. It is South Africa's premier horse racing event. It is therefore completely understandable that party-goers from all over the country flock to this hoity-toity event, dressed in all their best to see the racehorse favourite attempt to win the cup. Each year they have a theme and 2018 is Fashion.. The famous musical, Annie, heads to the Joburg Theatre with an all-new cast. Guests are invited to follow Annie as she finds a new home with billionaire Oliver Warbucks, his secretary Grace, and a dog named Sandy. The Knysna Oyster festival is spread across two weekends that promise constant fun and activities for the whole family. The Forest Marathon (half marathon), and the Pick n Pay Weekend Argus Rotary Cycle Tour, now a two-day event that is the biggest of its kind in the country. Other mid-week events will include the Wade Bales Wine Festival, the Pick n Pay Oyster and Wine Mardi Gras, the Knysna Lyster Company Shucking Competition and sports events such as the Scottish Leader Whisky Bowls Tournament and the Protea Hotel Knysna Quays Waitron Race. But of course the stars of the show are undoubtedly the oysters, served naked, cooked or garnished at over 30 local Tabasco Hotspots throughout the festival. 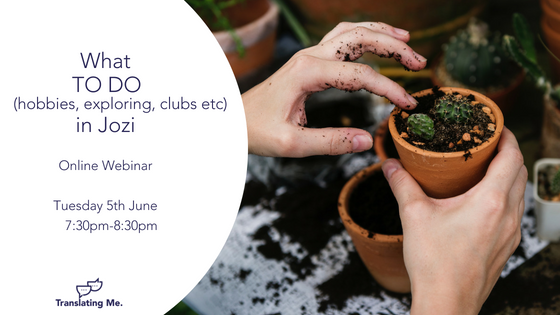 This month, come join us for an hour where we discuss what activities, hobbies, clubs, portable careers, and exploring to do in Jozi! This is one of my favourite markets of the year, so many inspirational people who have made beautiful items from jewellery, & homeware to little gifts for the kids. SA’s premier celebration of handmade, proudly local products returns to Joburg – and to a fantastic new venue: St David’s Marist Inanda, Sandton. 100+ Makers will offer the coolest stuff you’ve never seen! Fashion, decor, jewellery, homewares, beauty, food & wine… No mainstream here! Its time to stop living in your partners shadow. To regain the purpose and drive you once had, and to start using your passion and skills to leave a legacy before you leave. *Prepare your pitch, to respond to "so what do you do"
Wine tasting, great food and some musical entertainment. Rosebank's is always providing a new venue, market or shop for us to explore! This time its at the Keyes Art Mile, Rosebank's art and design district. that is home to a new artisanal food market – The Pantry Market at Keyes. Taking place on one Saturday morning a month, the market will specialise in small-batch, artisanal products, and will bring to the district everything from olive oil and honey to fresh produce, charcuterie, confectionery, sourdough bread and cut flowers. Lingo Links consists of small, friendly, informal groups where you brush up language skills through conversation with mother-tongue speakers. Speakers of any two languages meet for mutual practice, spending equal time (usually one hour) on each language. Groups where one or more mother-tongue speakers direct the conversation. e.g. The group meets to speak Greek, Chinese or Venda.